Philippa Lee opened the shop in 2010. Having worked as a potter in the area for over 16 years she has built up a loyal clientele whose kitchens are filled with the brightly coloured and highly functional casseroles, pie dishes, plates, jugs and mugs (all her work is Aga, oven, dishwasher and microwave proof). 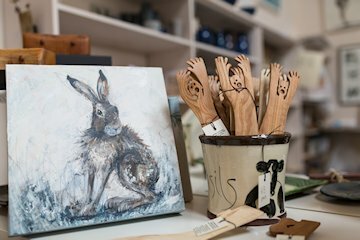 Her unique, humorous and lively designs feature hares and hens (hence the name of the shop) and many other animals and birds, and of course beach huts. Not satisfied with only pots, her clients are increasingly commissioning individually designed tile panels, to fit in the kitchen or bathroom. She makes many pots to order, for special occasions. 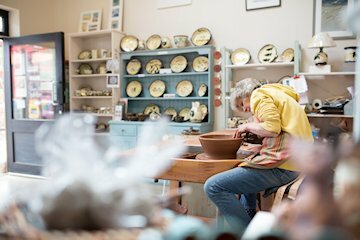 You will get a warm and friendly welcome from Philippa who will often be throwing pots on the wheel or decorating her work as you enter. 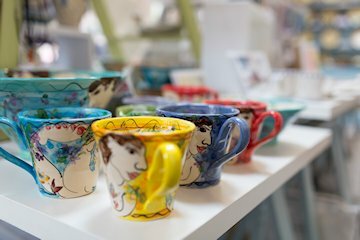 There is a fabulous mix of crafts in the shop, from baskets to glassware, ceramics and garden pots, prints and original artwork. ATTENTION ALL NEARLY WEDS: You know you need another list. 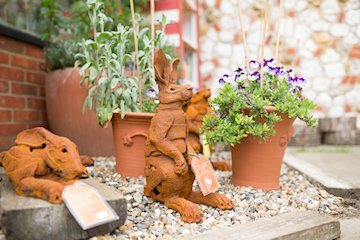 Come and create a Wish List at The Hare and the Hen Craft Shop and Pottery and give your guests a chance to buy something other than a bathtowel for you! Choose from Philippa Lee�s beautiful pots and have them personalised. Bold bowls, marvellous mugs, fantastic fish dishes, super salad bowls, plentiful platters, joyous jugs, brilliant breadcrocks!